Our friends Yvonne and Irving live a very beautiful part of Shropshire near the border with Wales. Yvonne has not been well lately, so I painted these hibicuses on heavy card for her. They're from our garden at La Petite Galerie. Today they went off to her with La Poste. If La Poste and the Royal Mail get their collective acts together, the painting will be with her in a day or so. When it does, the painted flowers should last a little longer than the real thing. I have always considered American artist Chuck Close's portraits literally overwhelming, and inspired by these huge paintings, I started doing several quite large portraits of my own. When I was living in Australia, Terry Lane came to our home in Frankston, and I did his portrait over several days. At about the same time, I painted another Melbourne radio personality, Doug Aiton. He used it on the cover of a charity Christmas carols CD. When I went into our local record shop to get a copy, I had difficulty finding it amongst the mass of CD's. But I was reassured by an assistant that they definitely had it in stock. 'I specifically remember checking it in', she told me, 'it's got this absolutely appalling portrait of Doug Aiton on the cover'. In 1962 I passed through the Costa Brava on a six month hitch hiking trip that took me from London to Johannesburg. In those days, long before the mass marketing of cheap package tours, traveling along the Spanish coast was like being in paradise. Not so today. Almost forty years later we had a family gathering of the clans to celebrate my sixtieth birthday and we chose Cadaques. It’s still a great place. But not for long. It’s relative isolation and the torturous road to the coast have protected the village from development for longer than most parts of the Costa Brava. Unfortunately, the tell tale signs of change are apparent everywhere. The most ominous of these is the large scale housing development and ubiquitous building cranes to the east - on the way to Dali’s house at Port Lligat. Perhaps one small positive result of the international financial crisis is that these projects will be arrested. Time will tell. Salvadore Dali is probably Cadaques’s most famous son, and he painted this beautiful Mediterranean port many times. Vicky and Matt, who live in Toulouse, both love Cadaques. So they commissioned a triptych for the apartment they are renovating. The embryonic early stages of it’s development are shown in the photos above. Each panel is 110 cms x 50 cms. The bottom one shows a very rough painted sketch (which looks almost as messy as the studio where the pic was taken). This is the 'just to get the basic idea' down stage. Then next is probably when I was about half finished. And the third is when I'm heading for home - but you can't see this one on my blog. 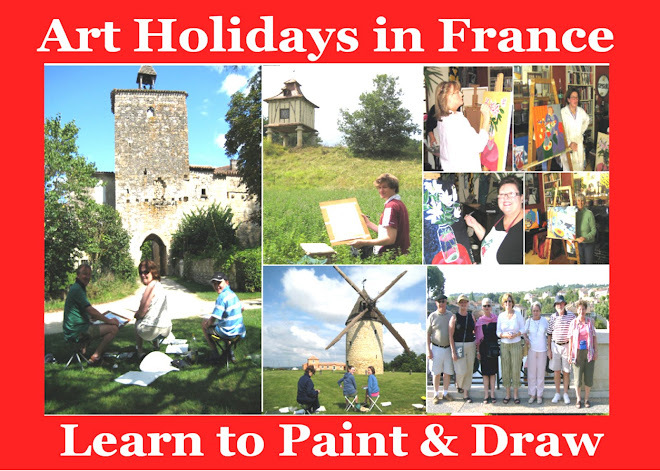 Anyone who lives near Mezin in southwest France can see the original in an exhibition above the tourist office. But anyone who wants to see the finished 'Cadaques Triptych' should click on the link below to go my online gallery. As I said in a previous posting, I painted this aboriginal inspired snake after a guest at La Petite Galerie asked why I only painted my snakes on doors, walls and tables. The Vasarely-like colours and the pointillist style both contribute to an obvious and attractive visual dazzle. For some reason that's completely beyond me, just after we arrived in France, I started to paint snakes. I painted them on tables. I painted them on walls. And I painted them on doors. Although I quite liked the pointillist dazzle that is set up by the dots of contrasting and complimenting colour, I never thought any more of them. (I was, however, sometimes conscious of the startled looks on people's faces when they came back from one of out guest bathrooms that's encrusted with snakes). And then one day, an American guest - Joan Rushton - asked if I'd ever done a snake on canvass. My turn to be startled. I could only answer "No! And don't ask me why." So, to make amends, I'm about to start a snake painting on canvas. In the meantime here are some of the snakes on doors at La Petite Galerie. Here's the link to my Online Gallery where you can look for my painting of a snake. Well, after many years of procrastination, I've finally changed my "why do something today when it can be put off until tomorrow" philosophy. On one matter anyway. My online gallery. 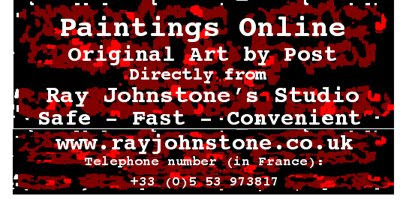 So, if anyone is interested, as of today, 8 July 2009, you can see my paintings ONLINE. And if you are really interested, you can look at all 88 paintings. (More to be added soon). Those of you who are really, really interested can EVEN BUY PAINTINGS ONLINE.